Park Street Church was erected in 1810. The most noticeable feature of the church is its tall and graceful spire. The building stands on the spot where the old granary stood [a grain storage warehouse]. The society was organized in 1809, with nine members from the Old South Society. 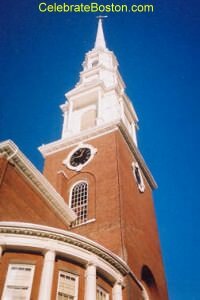 The Old South was at that time the only evangelical Congregational church in Boston. The church was made famous by its strong oratory, and Park and Tremont Streets became known in the early days as Brimstone Corner. According to Landmarks in the Old Bay State, by William Comer (1911), Dr. Edward Griffin, the original pastor at Park Street Church, would sprinkle sulfur on the sidewalk on Sunday mornings to attract the attention of pedestrians. Earlier reports had stated that many citizens of Boston were offended by Dr. Griffin's dogmatic sermons, and in derision had sprinkled sulfur from the front door of his home to the church. On July 4, 1829, William Lloyd Garrison delivered his first anti-slavery speech at Park Street Church, and so launched his emancipation campaign with the words: "Since the cause of emancipation must progress heavily, and must meet with much unhallowed opposition, why delay the work?" In 1903 the church was sold, and was nearly torn down. A preservation movement thankfully saved the structure. It had been proposed that an office building be constructed in its place, which would have forever damaged the aesthetic beauty of this conspicuous plot of land in Boston. The preservationists had emphasized six movements in U.S. history that Park Street Church could be identified with: (1) the revival of Calvinism, (2) the inauguration of foreign and domestic missions, (3) the growth of church music, (4) the anti-slavery agitation, (5) the peace movement, and (6) the introduction of Sunday Schools. The Old Granary Burying Ground is adjacent to the Park Street Church on Tremont Street.